#21: The Boat of Garten: True Highland Golf! You are here: Home › Blog › #21: The Boat of Garten: True Highland Golf! We have some friends visiting from Taos, New Mexico. They are staying in St. Andrews, but with one of them wanting to get on The Old Course, the others had a free day. When asked what they wanted to do, they said unanimously, "See the Highlands!" So I roped them into a round of golf in exchange for driving.... It was definitely not a hardship for me! 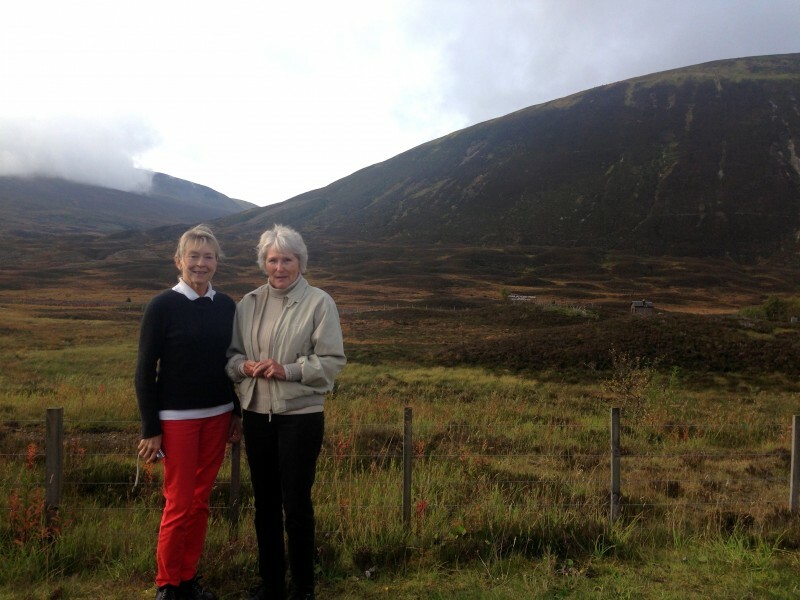 It's official, they are in the Highlands, and the scenery is truly breathtaking! We had a great day and we could not have asked for better weather. It was clear and crisp with the Autumn colours in full spread. I chose The Boat of Garten Golf Club as it is located just on the edge of the Cairngorms National Park. And at this time of year, The Boat of Garten has a reputation for having the most beautiful Autumn colours on display. We were not disappointed. So we set off to play, with Mary leading the way! It was a perfect afternoon for golf with no wind in sight! They said they have had a very good golf season and the course was in great condition. 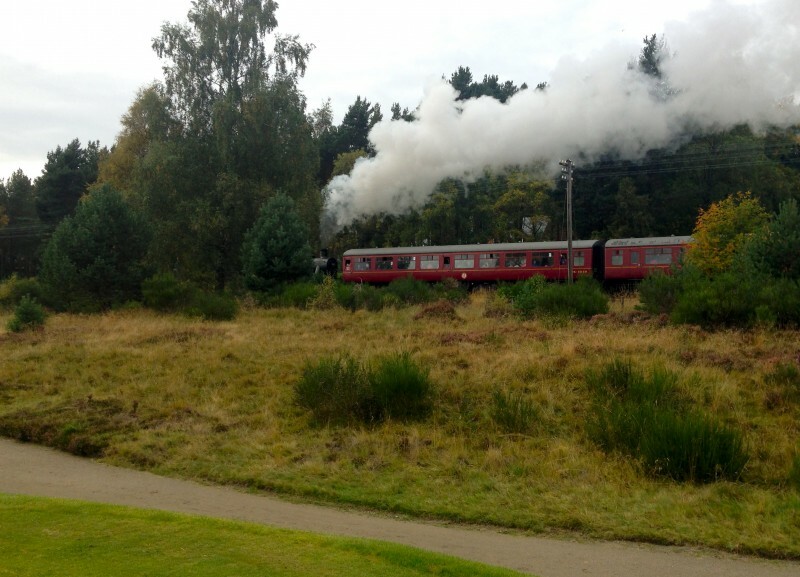 ‘The Boat’ (as everyone calls it), has the Highland Steam Rail line running along some of its first holes. The line runs between Aviemore and Carrbridge throughout the summer. We were just starting the fourth hole when the train was passing by and it was great fun! I had never seen it before in action, but it looks fantastic. Fortunately, none of us were anywhere near the rail line with our golf shots! The Boat has more hills than we expected: but it is the Highlands after all! It also has flag colours that correspond to the position of the hole on the green: red flags are to the front, yellow flags are to the middle and white flags are at the back of the greens. It really caused me to think about the yardages and my club selection. Thankfully, this is something I am able to do more of as my game improves! Jim was an excellent caddie, and here is the picture to prove it. He is definitely in the spirit of things with his +4's and cap. Mary and Phyllis just finishing off. As you can see, Mary used an orange ball so it was easier to spot ... smart Lady! But here we all are, safely on the green. It was great fun, but it’s a recurrent theme with my game: good golf, poor putting. Hmmm. This is the 6th on the Boat known as ‘The Avenue.' It's quite a tight fairway to find from this angle. It's the signature hole on the course, and it has the classic James Braid dog leg as well. Meanwhile I enjoyed seeing all sides of the course on most of the holes. Like I used to say to Grampy, ‘This way I am getting my monies worth for the green fees!’ And it means that I do get a lot more exercise than your average golfer. Jim came along and was a welcome addition as Caddie to both Phyllis and Mary .... He was also the official photographer on occasion too! Lucky him. I think I am right in reporting, though, that he did not get a very generous payoff at the end ... He had to make do with a cup of coffee and a piece of cake at the House of Bruar as his reward for a job well done. Oh and, not to forget, a lovely day out with a trio of ‘ladies of the links!’ It was a really special time, augmented by the company of good friends in such a beautiful part of Scotland: golf, true Highland style! 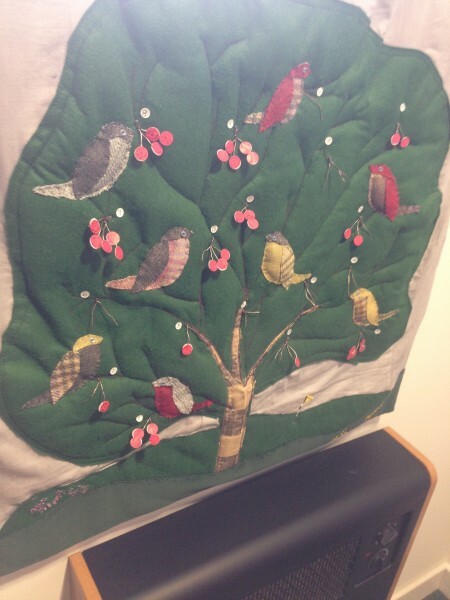 My own 'birdie tree' has yet to bear much fruit: but I will keep on trying!